This title should be the title of this podcast! OMG! Stirewalt is such a never Trumper this podcast is hard to stomach! Dana PLEASE find a new partner! Like Peter! This is a good podcast. Iâd like to tell Chris however that you should not think of yourself as a âgatekeeperâ to the people. Youâre not a gatekeeper that tells the people who is worthy of making it in the presidential campaign. The people are the gatekeepers who tell the county who is worthy. You just as journalists just tell us where the gate is. The people decide how to keep the gate. I am concerned that your expression is just a symptom of a deeper illness- the notion that journalism is tasked to tell us what to do, not our conscience. 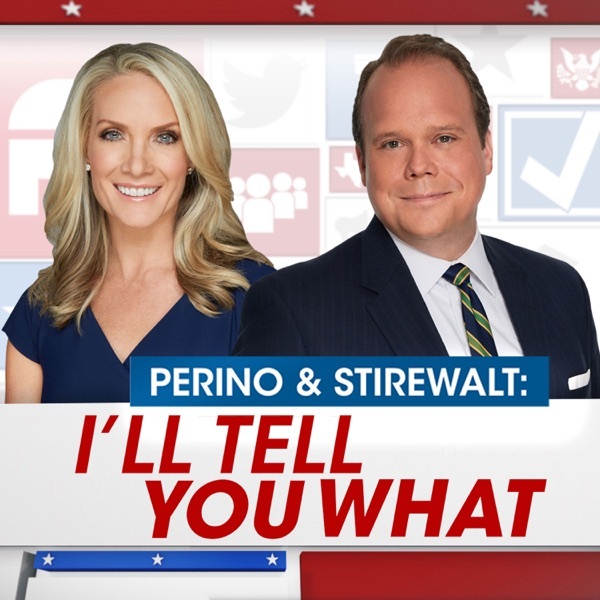 Perino and Stirewalt is my favorite podcast. The perfect mix of politics, humor, charm, wit and grace. With reputations preceding them, this dutiful duo covers topics too numerous to even categorize and all while keeping it light, relatable, and honest. They share signature oratory styles and an immense historical knowledge-base that when paired with their experienced careers provide for a pure communication of the ideas. Everyone who listens to podcasts will enjoy Iâll Tell You What-irrespective of political leanings. I look forward to Wednesday so I have a new podcast to listen to as I run around town doing the humdrum errands of the week. You make the ride in the car so much more enjoyable! I love the conversations between Dana and Chris, itâs as if theyâve let us into their living room and we overheard their friendly, personal conversation. I feel like I know them, and I definitely know I like them. I canât wait for Wednesday! More food talk! The Two. And Chemistry. More food talk! Not really. Youâve got a healthy mix there. This is a must listen appointment each week in the car at 1X playback speed. Iâd like to humbly suggest Messrs Gutfeld, Watters, or Williams as occasional fill in co-hosts. Perhaps slug the episode âThe Twoâ. I appreciate the genuine chemistry between Dana and Chris. I consider Mr Stirewalt the Mr Russert of our time; and that is a very good thing. The only thing wrong with this podcast is that itâs not long enough or enough days of the week. I appreciate the balance of fun conversation with the news of the day. Dana and Chris make me feel better that I am not alone in my view of the political world. Thank you! Bring on the food and cat and dog conversations! Love getting caught up on news stories in such a knowledge and light hearted way. I actually laugh out loud while I listen. This is my favorite podcast! I love it! Dana and Chris are delightful together. Perino & Stirewalt actually make politics palatable. The perfect mix of common sense, beltway insider information, historical perspectives, and food. Intelligent and artful. A great mix of reason, substance and frivolity. A much more enjoyable listen than Jonah G.
âLordy Dayâ is this a good listen! So enjoy listening to Dana and Chris (and Peter too when heâs on!). Love their political analysis and chit chat about food, trivia, Danaâs sisterâs cats and all things Jasper. Great source of news and entertainment! I love listening to this podcast every week! As a young conservative adult in todayâs world, this podcast is a great source of keeping up with politics and other news from two great perspectives. Listening to this podcast and watching The Five, I am always informed and well versed on the issues that are happening. Also I love when Peter is on the podcast. I always look forward to Wednesday to get the latest podcast. Dana and Chris have the right amount of chemistry to make the show informative and interesting. Great Chemistry, funny informative Great show!! Dana and Chris canât get any better than this!! This is my favorite weekly podcast! It makes Thursday morning the best of my week! I always learn something and really enjoy! 2 incredible people whom I respect very much created a casual âlightâ podcast with a very personal touch. News, history and their personal lives are blended into a treasure. In a crowded podcast world they created a unique niche. I LOVE LOVE LOVE what u are doing. Thanks Fan from LAPs Chris is the MAN & Danaâs sooo hott!! !Give them a well deserved LISTEN! These two have the best chemistry. Makes for such a fun hour! Both are incredibly smart and measured in there analysis. I love this podcast! Once a week isnât enough! This is probably my favorite political podcast. I have listened ever week since inception and really appreciate the mix of banter about politics and other fun topics. Dana and Chris make a great team and are fun, respectful and thoughtful, which is rare these days! Youâll enjoy spending time with Chris and Dana - smart, plugged in and super knowledgeable, and they have great on-air chemistry. Snappy pace with unbiased political analysis and charming banter. Chris will give you lots of âaha, I didnât know thatâ moments. Wish they did more episodes! Without a doubt, this podcast is THE ONE I look most forward to each week. The perspective both Dana and Chris bring to current events are what everyone needs. I love to listen to Stirewalt and Perino - I so enjoy the intelligent conversation. Every episode is interesting and fun. I always learn new things. It has become one of my favorite podcasts. This podcast besides being informative, makes me laugh, gives the best book, food and cold recommendations. My only regret is it does not have a daily episode. I could listen to Stirewalt and Perino all day. Intelligent, fun, eclectic and smooth. The podcast seems to finish in a flash, leaving me wanting more. Their personalities mesh in a refreshing banter. You can tell they genuinely like each other. Outstanding! Dana and Chris never fail to entertain while informing me about political topics. Their chemistry is that of good friends just having a conversation which I want to listen in on. Whether the topic is politics, culture, books, or personal anecdotes Iâm loving it! You make me hate 9 hours out of my week! I spend 10 hours commuting to work during the week. I spend 9 of those waiting impatiently for the next episode to drop!! But the hour I get to spend listening to your insight makes up for it all!! Every week, I look forward to Wednesdayâs release of the latest podcast from Perino & Stirewalt. Their refreshingly balanced and honest dissection of recent events and thoughts on upcoming elections and other happenings equip listeners with historical bases to form their own individual opinions. All this is offered with humor and excellent repartee. Well done! Dana Perino and Chris Stirewalt have a natural and balanced style that is really enjoyable. The podcast format lets them have a longer conversation that doesn't have to fit into a 20 second slot, so a topic gets some breadth and depth, and it never feels hurried. Both have the experience and insight to put current events into a balanced historical perspective, and give you something to think about. Keep up the great work! I enjoy listening to Chris and Dana! There perspectives are fresh and should be heeded by my fellow 90s kids âð¼ Iâm a senior at Georgia Southern University and itâs good to hear them both enjoying what Savannah, GA and Bluffton, SC have to offer. To them I say thank you and GATA! Stirewalt gave a remarkable keynote address at the Savannah Book Fest Feb 15. He spoke about the cycle of American Populists throughout our history in a most intelligent, witty manner, captivating a large audience of book readers on both sides of the political isle. Boy, does he have stage presence! Go buy his book Every Man A King. I look forward to the weekly podcast. Dana and Chris are great together. Their analysis is quick and smart on weekly events. They have a tough fight with Jonah for the wonk vote but I think they can pull it out if they keep doing what theyâre doing. This podcast rocks. Stirewalt has a face made for radio. Free Jasper!!! Chris and Dana have the perfect combination of smarts, humor and insight. Great back and forth balance with relevant topics and and conversational yet intelligent commentary. Chris and Dana make it so easy to follow politics without all the swamp lingo. They break it down for the everyday person. Very unbiased and and call it like they see it not taking sides. Makes it easy to determine the facts without all the regular DC hype. I wish that did one every day! I could listen to them all day long. Brilliant and insightful!! Great political insight from two of the best. Dana and Chris do a great job of giving you news you can use by combining wonky talk with humor. Perfect balance of politics, history, and cat updates. Love Perino and Stirewalt! Simply one of the best podcasts. Dana and Chris are both smart and funny. I donât want to hear 100% politics, and they do such a great job of balancing. This was the best episode Iâve heard. Very funny. The only Fox News show I have any connection to anymore. These two are the George and Gracie of political commentary ...and when Peter is a guest? Greatness ensues. Love you guys!!! One of my favorite podcasts. Love the mix of current political topics and personal experiences of Dana & Chris. Negatives: terrible sound engineering- Dana too LOUD while Chris too soft. Too âdeep in the weedsâ on some topics. I donât watch Fox News all day - just a casual fan. We all donât know who youâre talking about. Please give a brief intro on some people youâre talking about. For example Dana started talking about Howard Schultz - it took me a while to figure out who you were talking about (really loved to hear about the interview). Lastly can the trivia. Whatâs the point? Seems to me youâre trying to embarrass Chris or just show off. They work well together and are well informed on current events. I am new to Podcasts and chose you two first because I like both your styles and your approach not only to politics, but also life in general. The length is perfect for my morning walk with Duke, our dog.I just subscribed, donât make me regret it! Essential part of my week!!! Iâll tell you what ... as a recovering politician/governmental professional now in business, this show not only gives me my weekly political fix but drives me to critically think further into current events, history and pop culture. Dana and Chris are paired together perfectly and compliment each other better than any glass of wine and cut of steak Iâve ever had. Iâm not sure what I would do without their takes on current happenings, amazing insight and chaser of trivia. Iâm hooked to say the least. Dana, heard your comments about Mitch Daniels. I live in Purdue country and my son is a graduate. I was thrilled with the tuition freeze he implemented. I wanted to mention that Mitch has recently been in the news for suggesting that all students have to take a civics exam (similar to the one given for citizenship) in order to graduate ð¤·ð»ââï¸. He is very thoughtful and progressive! Perino and Stirewalt are perfect for politics geeks like me. Itâs the perfect mix of current events, historical perspective and pure fun.